America’s colleges are raking in more money than ever before. The Council for Aid in Education estimates they had a $40.3 billion haul in 2015, a record for its annual survey of higher education fundraising (pdf). Just 20 schools pulled in $11.6 billion of those dollars, representing 28.7% of the total. 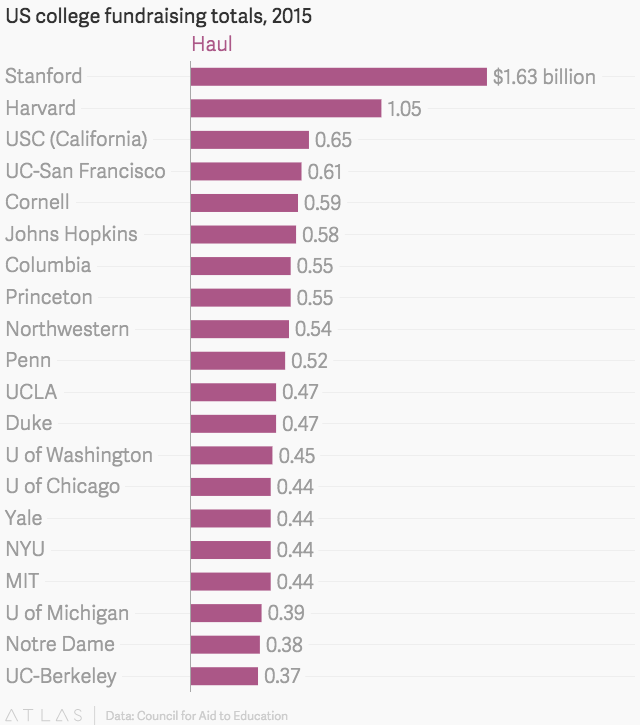 Stanford brought in $1.6 billion alone (itself a survey record), and Harvard joined it in the billion-dollar club with $1.1 billion in gifts. The 20 schools on this ranking account for less than 1% of the total number of the nation’s colleges and universities. There’s an argument to be made that such ferocious fundraising by schools already swimming in cash only serves to exacerbate social and racial inequalities. The $400 million that hedge fund manager John Paulson gave to Harvard’s School of Engineering and Applied Sciences last year was only $100 million shy of the entire endowment of Howard University, the wealthiest of the nation’s historically black colleges and universities. The data that can be used to forecast gift receipts are limited to factors in the economy, such as the performance of the stock market and the expansion of the overall economy. On average, more than a third of the contributions to any given college come from twelve large gifts, and such gifts are often in the form of appreciated securities. Therefore, the stock market plays a key role. Its 2015 calendar-year performance—representing the first half of the 2016 fiscal year—does not bode well for contributions.